PRODUCT: The Alpinestars Supertech M10 helmet has been on the market for about one year, after debuting at A1 in 2018. It’s been in development for years and addresses every issue that has become topical in the helmet industry over recent years. Alpinestars licenses MIPS technology to address concerns over rotational energy impact. The M10 has a multi-layer carbon shell, which is among the lightest and stiffest in the business; it has a proprietary break-away visor and an emergency-release cheek-pad system that allows the helmet to be removed easily in case of severe crashes. The M10 is also compatible with any hydration system, allowing a passage for the feed tube into the chin bar area. Basically, there’s no current premium helmet feature that hasn’t been incorporated here. POSITIVE: We’ve been wearing the M10 for almost a year, and while we can’t speak to safety issues with any first-hand authority, we can say it’s been comfortable, durable and of very high-quality construction. When a helmet fits this well, it allows you to ride without distraction. The finish is excellent, and the helmet fits as well today as it did when it was new. It’s one of the lightest helmets we’ve used. Our size large is 2.8 pounds. 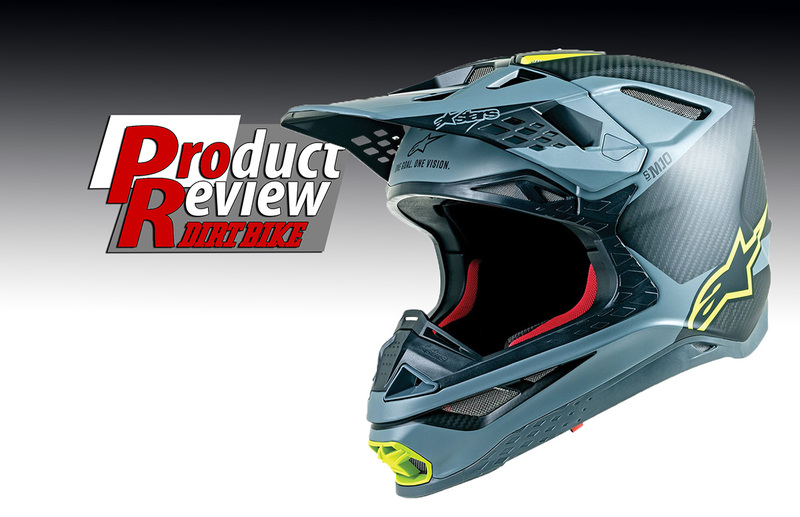 The ventilation system is typical of modern MX helmets, which is to say very good. NEGATIVE: The only real complaint is that the visor is fixed and offers no adjustment. This was done for a reason; the visor fits flush with the shell and can’t catch on terrain in a tumble. It’s also an expensive lid, as you might expect. BOTTOM LINE: There are only three or four brands that we consider true premium helmets today. The M10 is one of them. With any helmet, it comes down to trust. Alpinestars scores very well in that category.